Demantoid is the green gemstone variety of the mineral andradite, a member of the garnet group of minerals. 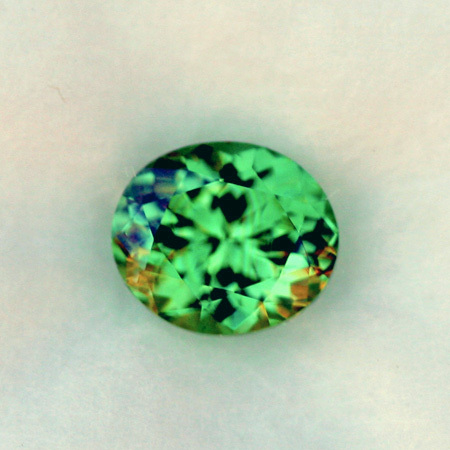 Demantoid are Chromium rich garnets. Chromium is what gives demantoids their rich green color. Demantoids the most expensive and rare of garnet gemstones, with fine specimens commanding prices of thousands of dollars per carat. The chemical formula is Ca3Fe2(SiO4)3 with chromium substitution as the cause of the demantoid green color. Ferric iron is the cause of the yellow in the stone. The name Demantoid is derived from the ancient Greek language and translates to mean "Diamond Like Luster". 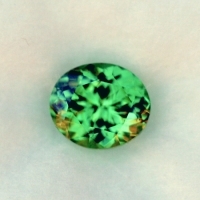 Demantoid garnets have a higher dispersion than that of Diamonds and produce a rainbow of terciary flashes in reds, blues, greens, and yellows as the gem is moved in the presence of light. Garnet is the designated birthstone for January. Vivid slightly bluish green color with multiple color dispersion in any strong light source. Excellent cut and polish. VVS, eye clean clarity.